Tonight I wanted pizza, but I also wanted a complete meal with veggies and all – my solution – a homemade pizza with Spinach, goat cheese, & feta – YUM. 2 teas. of yeast – 2 1/2 cups flour, a teas. each of salt, pepper & sugar; knead dough (if you have a bread machine – use dough setting) when you have a smooth ball of dough – transfer to a floured surface and let it rest for 5 minutes; preheat oven to 400 degrees; form dough into a 12 inch circle and transfer to greased baking sheet. I like to pre-cook the crust for about 5 minutes so that it is nice and crispy after you have added the toppings. To complete the pizza – spread about 1 teas. of olive oil on the crust; top with sauce and add your favorite toppings – I used fresh spinach, about 2 tbls of goat cheese and 2 tbls of feta sprinkle with mozzarela cheese and bake for about 12 minutes. Enjoy with your favorite beer or a nice Italian wine. 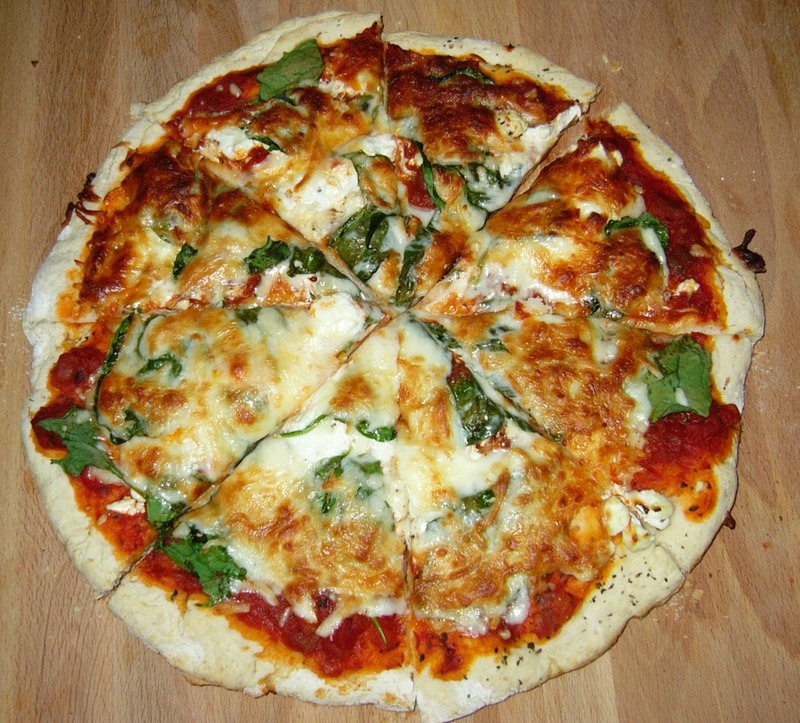 Make your own and enter the pizza contest at http://www.80breakfasts.blogspot.com/ ! Sounds fabulous. Thanks for joining HHDD.